Birmingham Bears all-rounder Grant Elliott says he and his team-mates ‘owe’ Northants Steelbacks ahead of Tuesday night’s NatWest T20 Blast clash at the County Ground (start 6.30pm). David Ripley’s side secured a last-ball victory at Edgbaston when the teams met three weeks ago, with Rob Keogh crashing the winning boundary. That was the Steelbacks’ fourth straight T20 win against the Bears, and New Zealander Elliott believes it was a match his team should have won. The Bears have certainly found their form since losing to the Steelbacks, and they travel to Northampton boosted by three wins on the bounce and with a little bit of revenge on their minds. “We’ve played some good cricket in the last week and it was another great win over Lancashire Lightning,” said Elliott. “But now we move on to Northants which will be a tough game, and we know we have to be right on it again. “They beat us at Edgbaston in a game we probably should have won, so we owe them one. “It will be another good atmosphere at Northampton because this T20 comp has been brilliant and, the way it is structured, the games come thick and fast, so if you get on a roll, like we are, you can’t wait for the next game to come. Steelbacks have won each of the four previous T20 meetings between them and the Bears, a run that stretches back to the semi-final win at Edgbaston in 2015. Only one of those wins has come at the County Ground, and that was last July when Steelbacks secured a 74-run victory after hitting 200 for five and then bowling out the Bears for 126. Steelbacks go into Tuesday’s game in fourth place in the North table, with a game in hand on the teams above them. Bears are third, one point better off than Northants, and whoever wins at the County Ground will go top of the table. 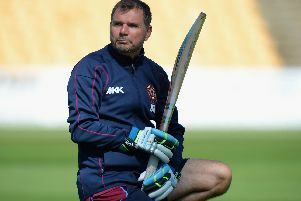 It’s the first game in a hectic little spell for Steelbacks, who are at home again on Thursday when they enertain Lancashire Lightning, before going to New Road to take on Worcestershire Rapids on Saturday.